Six women sustained injuries when the police fired tear gas shells and smoke bombs at a marketplace here to disperse protesters, who had enforced a road blockade demanding withdrawal of the citizenship bill, according to a vendors' association at the market. There was, however, no immediate official confirmation about the incident. Shantidevi, the president of an association of women vendors at Khwairamband market here, claimed that the police on Sunday used force on the agitators, who had been protesting peacefully. The women vendors at the market here had put up posters and banners and set up tents, blocking roads, to press for their demand, she said. Prohibitory orders under section 144 of CrPc have been imposed in the area in the wake of agitations against the contentious bill. Shantidevi said the police tried to pull down the tents and tear apart the posters and banners that sought the unconditional revocation of the bill. The women, however, refused to cow down, following which a clash broke out between the two sides, she said. "The security officers fired tear gas shells and smoke bombs, which left six women injured. The situation turned uglier when they tried to take one of the injured women into custody and the agitators had to thwart the attempt," Shantidevi claimed. The injured women were then taken to Regional Institute of Medical Sciences (RIIMS), she added. Criticising the use of "excessive force", Y Dillipkumar, the convenor of Manipur Peoples Against Citizenship Amendment Bill (MANPAC), said the women were "protesting in a democratic manner". "The assault on the women vendors indicates that the state government is acting under the command of the Union government," he said. MANPAC is an umbrella body of civil societies and organisations that had been protesting against the passage of the legislation. Dillipkumar asserted that the agitation against the bill will intensify in the days to come. "The members of MANPAC, along with common people, will hit the streets seeking withdrawal of the bill and implementation of National Register of Citizens (NRC) exercise in the state to weed out illegal immigrants," he added. 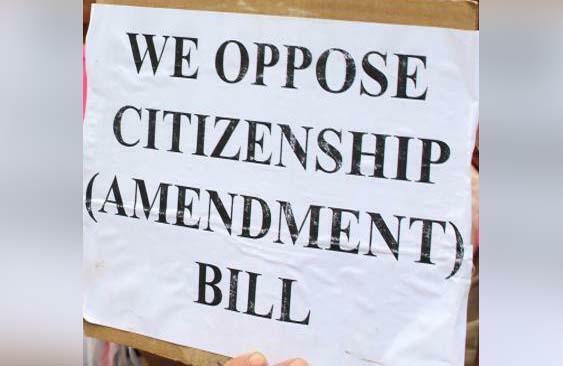 Manipur Chief Minister N Biren Singh had earlier said that the BJP-led government in the state would not support the passage of the Citizenship (Amendment) Bill unless there was a provision to protect the people of the northeast. Meanwhile, security has been beefed up across Imphal Monday in the wake of the agitation. A large number of security personnel belonging to state and paramilitary forces have been deployed in Imphal to avoid any untoward situation. The Citizenship (Amendment) Bill, passed by Lok Sabha on January 8, seeks to grant nationality to non-Muslims who fled religious persecution from Bangladesh, Pakistan and Afghanistan, and entered India before December 31, 2014. Protests against the bill have rocked the entire northeast over the past six weeks, with several organizations and political parties claiming that the bill threatens the identity, language and culture of indigenous people.